Written by Brian Ehresman. Media by Deloy Cole. Featured image source: Danielle Photography. 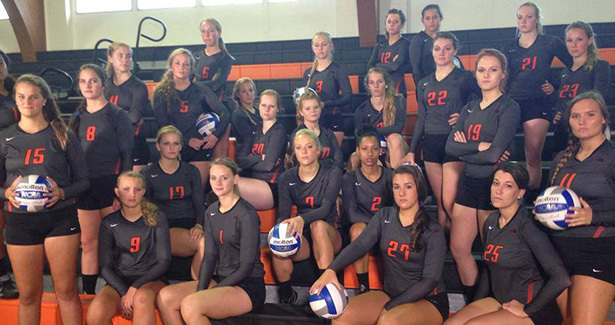 The Greenville College Women’s Volleyball team has had its fair share of close, hard-fought, and stressful matches in 2014. 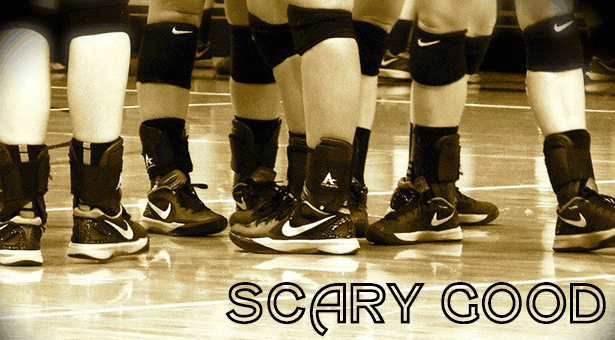 This past week, the Lady Panthers seemingly switched their season genre from a drama for Greenville fans to a horror film for the rest of the SLIAC volleyball programs. Clicking on all cylinders, GC swept through three opponents in straight sets during a dominating week. Greenville opened up the week hosting a familiar foe, the Principia Panthers and star Tess Rountree. Earlier in the season, GC squeezed out a five set come-from-behind victory over Principia, in which Rountree smashed 35 kills. This time, however, Coach Tom Ackerman and the Panthers didn’t need any comeback heroics. In one of the more impressive and dominating home victories in recent memory, Greenville breezed right through Principia by the scores of 25-12, 25-18, and 25-18. In a total team victory, GC left Principia with nightmares from the moment they stepped into HJ Long. said Ellen Lueking, who dished out 32 assists to lead the offense. Allyson Mitchell and Nicole Schaeffer had 12 and 11 kills, respectively, while Schaeffer dug up 17 Principia spikes to anchor the defense. A huge key to the match was limiting Rountree to just nine kills, which can be credited to every GC player who touched the floor. Savannah Sells, Miss Fayette County Sierah Ruffner, and Marissa Erwin all were enforcers at the net, getting their hands on several spikes to slow down balls for Jaime Schollenbruch and Kirsten Laune to dig up. Another advantage for Greenville was the balanced offense, as five players had at least four kills, an impressive feat in just three short sets. Lueking, one of the top setters in the conference, has done an outstanding job of spreading the volleyball around to different options, as teams can’t just focus on one hitter in the GC lineup. “I want to run our hitters away from the other team’s good blockers. Then, we try to run the middles as much as possible…we can use our middle as a decoy to keep our outsides and opposites in one-on-one situations. Finally, if a hitter is hot and is getting kills and solid swings, we obviously want to get the ball to that hitter,” Lueking explained when asked how she decides where to set the ball. Earlier in the day, the JV team got in on the sweeping action with a straight sets win over Lewis and Clark. 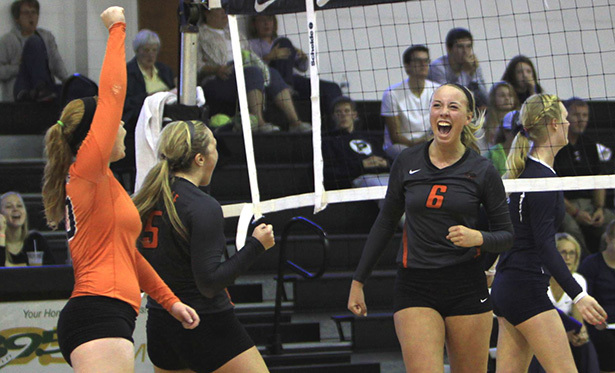 Later in the week, the Greenville Volleyball squad traveled to Webster for matches against Fontbonne and Iowa Wesleyan. GC packed their brooms on the people movers and dusted off the Griffins and Tigers quickly. In the Fontbonne match, the balanced offense continued, as five hitters had at least seven kills, Schaeffer leading with 13. Lueking had 41 assists and Schollenbruch collected 21 digs from the back row. Against Iowa Wesleyan, Schaeffer again had 13 kills to lead the offense and Lueking matched her earlier assist total with 41. Mitchell served up three aces, and Schollenbruch dove for 17 digs. The two wins improved Greenville’s record to 15-5 overall, and 10-0 in the SLIAC. After a tough non-conference schedule, the stiff competition seems to be paying off for the Panthers. “We started off the season with trouble staying mentally tough and struggling to find the cohesion we need to play together. Coach Ackerman has been very intentional in the things that we do as a team to build in that area and that is what has made us successful,” said Lueking. If the Lady Panthers continue to play at the same pace, opponents on the other side of the net will leave HJ Long feeling as if they just walked through a Haunted House. Happy early Halloween to the rest of the SLIAC. Previous articleThe History of GC: Should We Care?